No one is completely sure when mankind started believing in the existence of ghosts. It appears that many of concepts like the burials and funerals were early attempts to appease the spirits of the dead so they wouldn’t disturb the living. This first known recorded true life accounts of ghosts were also two of the strangest. Plutarch in the 1st century AD and Pliny in 50 AD detailed a couple of haunting spirits complete with chains, groans, and accusations of murder. Plutarch told of a home in one community that so plagued the neighbors they shut up the dwelling, but Pliny had a longer tale. He described a young scholar who agreed to take up residence in a home where a ghost was rumored to haunt. The young man was a stalwart fellow who refused to be intimated by the dead. He followed the chain rattling ghost about until he got the story of its murder out of it. He dug under the floor where the ghost routinely ended its nightly ruminations and found a bony skeleton wrapped in chains proof of the story told by the ghostly presence. Many people have remarked how similar Pliny’s paranormal account is to modern day stories. Some ghost stories are strange because they speak of a tragedy that never ends. Some dead never find peace it seems and are doomed to experience their feelings of betrayal and terror in an endless loop forever. The end for Catherine Howard really started right at the moment she seemed to be on the path to a bright new beginning. Her uncle found her a place at Henry’s court as the lady-waiting to the King’s wife Queen Anne of Cleves. Katherine was a beautiful, but poorly educated and not very bright a potential lethal combination at any court of that time. She had already been molested by one of her few teachers and been the consort of an older man. The best thing that could have happened to the young woman would have been to have been discovered by an up and coming young man looking for wife. Unfortunately for Catherine it was the King’s eye she caught instead. Anne of Cleves was Henry’s fourth and least favored wife. The marriage was never consummate as the German born Anne was not attractive to the King. The feeling was apparently mutual as Anne was terrified of provoking Henry’s wrath and earning the same fate as Anne Boleyn. Her family had the phrase “God send me well to keep” engraved around her wedding ring, and perhaps this worked for when the pretty Katherine arrived as her lady-in-waiting Anne was off the hook. The writing was practically on the wall for Katherine as she was in fact the second cousin of Anne Boleyn the wife the King had behead for adultery among other charges, but the Boleyn family was happy to be back in the King’s good graces once again as the romance heated up. Anne of Cleves was offered an annulment which she took with good grace in public and no doubt with a sigh of relief in private. This paved the way for the King’s marriage to Katherine, but the situation was far different for this young woman than for her cousin. While by all accounts Ann Boleyn and Henry had a passionate affair much time had passed since that union. The King now was well passed stout and working on portly. He had an ulcerated wound on his thigh that never completely healed and which often reeked. It’s possible that the annulment between Anne of Cleves and the King happened so quickly because Henry hoped Katherine was pregnant with his child, but that was never to be. Repulsed by the King and without the smarts of predecessor Katherine not realizing her danger began an affair with Henry’s favorite male courtier Thomas Culpeper. She should have known better especially consider their meetings were arranged by Lady Rochford who was the widow of Anne Boleyn’s brother George. Blackmail started up against Katherine as the affair became known to many and she found herself having to find positions to appoint anyone to who might feel talkative. It wasn’t enough. Catherine was accused, and while she felt the King’s love for her and her youth would be enough to protect her she was very wrong. Catherine was charged with treason and ordered to keep to her rooms. She escaped the guards momentarily and fled down the hallway to the chapel where she knew the King was hearing Mass. She screamed and cried for her husband so pitifully that almost everyone who heard her was moved to pity. 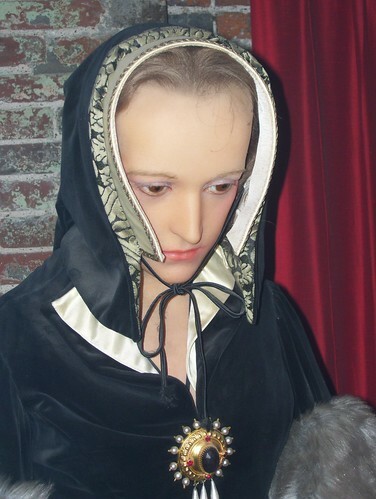 Almost all with the notable exception of the King, and the girl was stripped of her title and in the winter of 1541 both she and her lover were beheaded. Their heads were placed on spikes atop the London Bridge and that should have been the end of it. But the story doesn’t end there. Catherine’s ghost has been seen repeatedly not at the sight of her execution, or hanging around the London Bridge looking for her lost head, but making that run for her life over and over. She is seen as a young woman with long flowing hair still beautiful despite her obvious terror. She runs screaming to the chapel and pleads with the King for forgiveness and mercy. Just as he did all those generations ago Henry the Eighth remains unmoved by her plight. Built in 1863 in the English village of Borley it seems to have been almost destined to be a haunted spot. It was built on the site of a former monastery and such spots often hold surprising dark secrets. The first sign of ghost trouble didn’t show up until around 1900 or so thorough and seemed to focus on more modern times. The public found out about the Rectory from Harry Price and his Society for Psychical Research after they were called in to investigate. For Price who was interested in getting the public interested in the scientific study of ghosts found a seemly endless number of stories to explore within the old Rectory. According to legend when the spot had been a monastery a monk and a nun fell in love. The young couple tried to elope, but they were caught. The monk was hanged, but a worse fate was waiting for the nun. She was bricked up alive and left to starve. Her ghost was seen often and her spirit is the one Price believed was attempting to make contact. According to accounts by Henry Price in his notes and later book on the subject she was the one who wailed, walked and wrote on the wall. The Smith family who were living in the home at the time complained of smashed windows, furniture being moved, and the sound of bells ringing. Eventually the strange goings on drove them from the rectory. When the family of the Reverend Lionel Foyster moved in the weirdness continued and a flock of ghost hunters showed up to discover its secrets. There were many séances through the years many featuring the spirit of a young woman who claimed to be the ghost of the nun. Stranger still was yet to come when on one night in 1938 the ghost predicted the rectory would burn that very night. It didn’t, but the building was destroyed by fire just over a year later. It makes sense that with the all the weirdness of ghostly goings on and with all the cameras folks have been lugging around for the past few generations that at least one person would get a convincing shot. And someone did. In the English town of Shropshire the Town Hall burned to the ground. It wasn’t the first time such a tragedy occurred in the area. Long ago in 1677 fire had destroyed the wooden homes and buildings in the area when according to local legend a young girl named Jane Churm set fire to a thatched roof with a candle by accident. Her ghost has been seen on many occasions in the area. The Town Hall had been built in 1905, so on that day in November of 1995 spectators watched in sadness as fire consumed the historic old building. A local resident named Tony O’Rhailly snapped photos of the event and was surprised to find in one of the pictures a strange sight. Framed in doorway of the burning building the figure of a little girl is plainly visible. If you want your own ghost then according to many internet, television, and movie accounts the fastest way to get your own weird haunting is to get an Ouija Board. 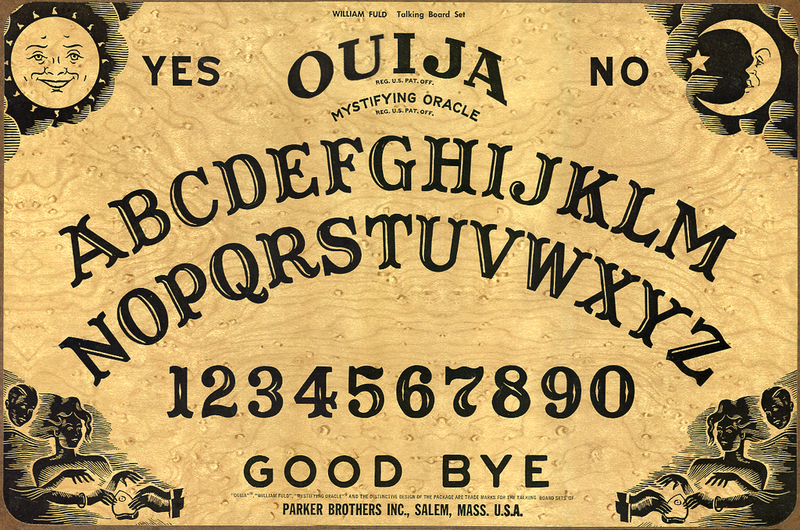 Also known as a spirit board or talking board this is your very own gateway to scaring yourself silly. The board was invented as a game by and sold by Parker Brothers, but thousands of people have claimed that whatever they called up using the device…decided to stay.